HKU BBA(Law) & LLB Year 3 students, Alison Li Pui Wun, Edelweiss Kwok Yuet Yi and Sally Yiu Man Ki together with two CUHK LLB students and four computer science/information technology experts won the Hong Kong round of Global Legal Hackathon. They will represent Hong Kong in the next round of the competition, with a chance to head to the finals in New York in April. 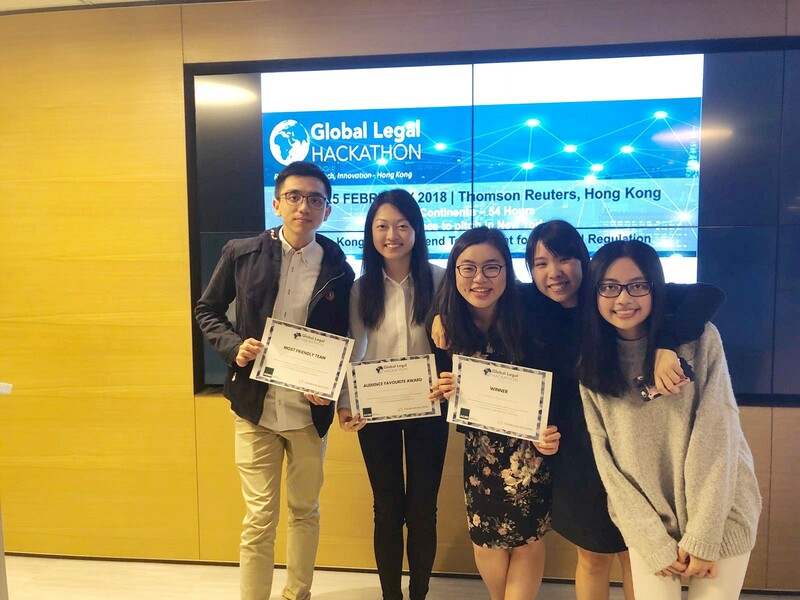 The Global Legal Hackathon 2018, which took place on 23-25 February 2018, was co-organised by various legal-tech companies including IBM Watson, Global Legal Blockchain Consortium and Integra, and is one of the largest legal hackathons taking place in over 20 countries and 40 cities. 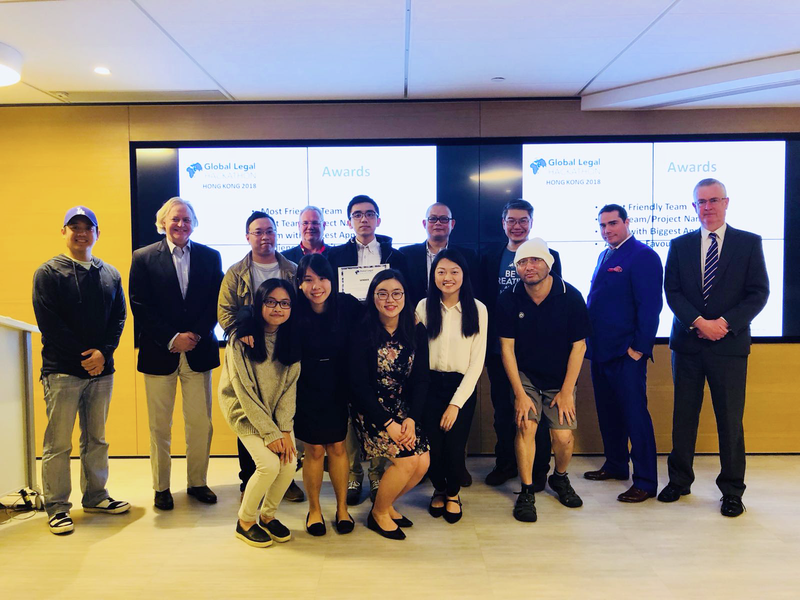 It brought together stakeholders in the legal industry, including legal professionals, technologists, business strategists and law students in an intense sprint of legal tech education, creativity and invention. Each team was required to create a technological solution for improving the legal industry worldwide under a tight schedule. A video for the event can be viewed here. The winning project "Decoding Law" is a machine learning powered browser plugin that helps people read and understand legislation. It finds the relevant section(s) of legislation by identifying keywords in questions entered by users, explains defined terms for easier navigation and breaks down complex legislative drafting into simple language, which is particularly useful to unrepresented litigants. If you are interested in knowing more or want to support the team, please like and follow their Facebook page. They need as many likes as possible to get to the final round. Alison, Edelweiss and Sally are newbies to hackathon. Edelweiss said, "the competition is an eye-opening experience that provides lots of different insights for legal tech that I have never imagined before." Alison said, "the GLH is a great platform for us to meet legal and tech talents and exchange and even realise our innovative ideas. It is indeed inspiring to see different teams' approaches and solutions, which is unprecedented but feasible." Sally said, "I am indeed impressed to see so many talented minds collaborate and come up with feasible solutions to solve certain legal problems in the society." For more information, read Brian Tang (curator of the event)'s coverage in Asia Legal Business. hi there. It's really good article and great news. I am glad for Alison Li Pui Wun, Edelweiss Kwok Yuet Yi and Sally Yiu Man Ki and for their success. i'm pretty sure they didn't use any help like https://pro-papers.com/law-writing-service with their homework or any other type of school, college or university work. They are idols of present days, i think. We should be equal to people like them.